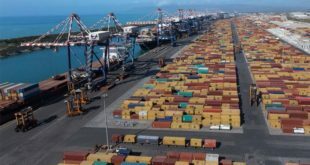 While there may be clouds on the horizon in the form of tariff and trade war fears, economic fundamentals are likely to win-out in the long run, according to the Global Container Terminal Operators Annual Review and Forecast 2018 by global shipping consultancy Drewry. 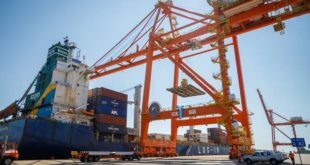 Against this positive picture near term container port capacity expansion will remain relatively subdued following several years of under investment, particularly in greenfield projects. As a result, average utilisation levels are expected to rise markedly across almost all regions of the world by2022. 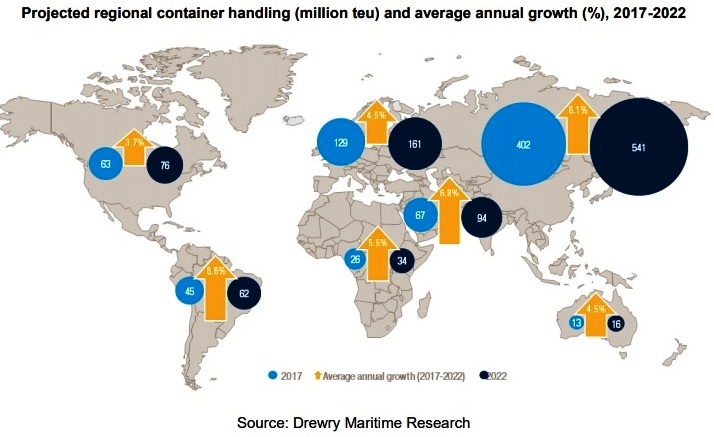 Drewry’s latest five year container port demand forecast is based on average global growth of just under 6% per annum, lifting world container port throughput in this period by almost 240 million teu. 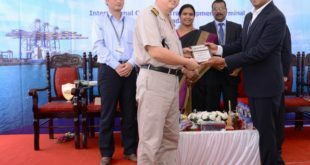 The global container port industry is now of such a scale that 6% annual growth equates to around 45 million additional teu each year, broadly equivalent to the size of the world’s largest container port, Shanghai. Bottom-up capacity projections on a terminal-by-terminal basis present a more conservative picture, with global container port capacity projected to increase by around 125 million teu by 2022, a growth rate of just over 2% per annum. This is clearly well below projected demand and reflects the cautious investor sentiment towards greenfield projects over the last few years. As a consequence, average utilisation at the global level is forecast to increase significantly from 68% in 2017 to around 80% by 2022. Average regional utilisation levels are projected to increase most sharply in Greater China, North Asia, Southeast Asia and West Coast South America. 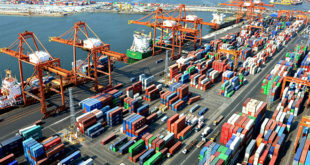 “Assuming our demand projections are well founded, and the threat of trade wars dissipates, we expect many terminal operators and investors to review and potentially increase their activity levels in terms of new capacity additions,” said Neil Davidson, Drewry’s senior analyst for ports and terminals.